Theater Review: ‘The Penitent’: Truth at Any Cost? 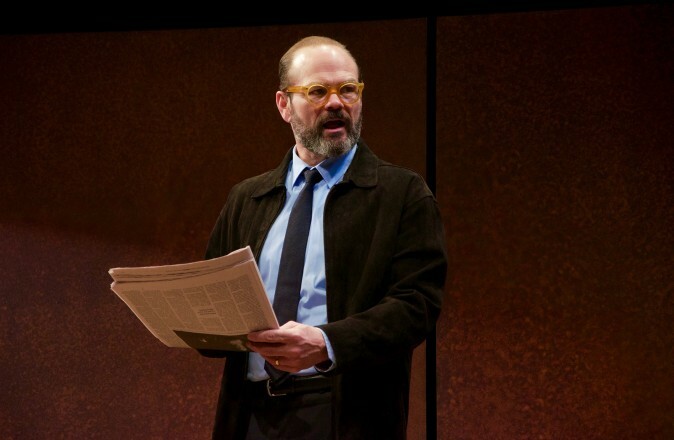 David Mamet is, hands down, the most stymieing, infuriating, pull-your-hair-out playwright for actors to act. This is a play about truthfulness, and the extent to which one should stand up for it. When performed well, though, his plays reveal multiple layers of meaning and a mind like a surgeon’s scalpel. The best example is the film version of his play, “Glengarry Glen Ross.” But look who’s in it: Alec Baldwin, Al Pacino, Kevin Spacey, Ed Harris, Alan Arkin, and Jack Lemmon—masters of the craft. 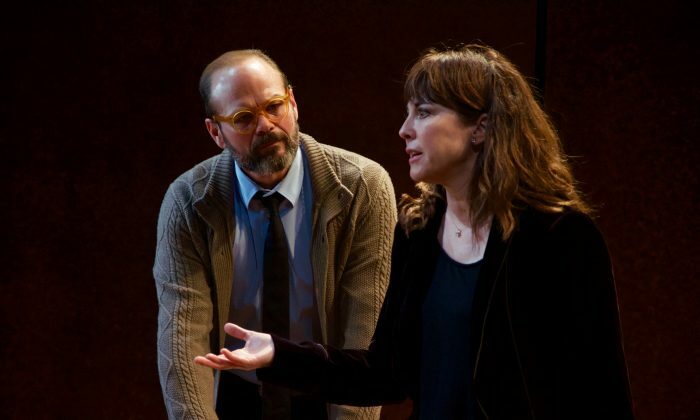 Mamet’s new play “The Penitent,” directed by longtime collaborator Neil Pepe and premiering at the Linda Gross Theater, is no exception to the rule—it’s straight-up Mametian. 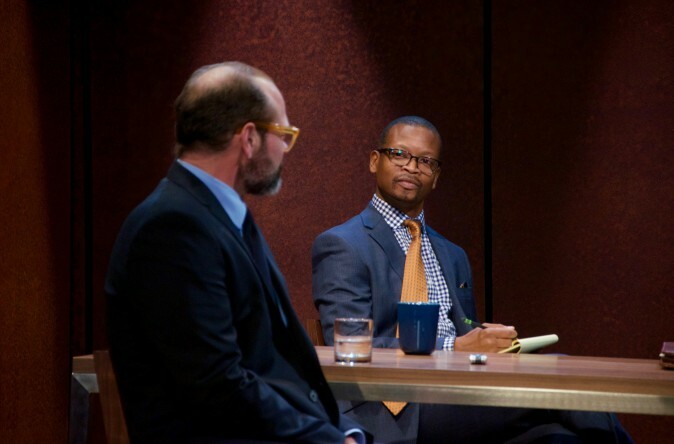 So the question becomes, as ever with his work: Are there actors in this production who can “speak the speech … trippingly on the tongue,” so as to satisfactorily elucidate the hyper-pithy Mametian content? This is a play about truthfulness and the extent to which one should stand up for it. Charles (Chris Bauer of HBO’s “True Blood”) is a psychiatrist who had a psychopathic patient who has committed multiple murders, and he refuses to testify in court, wanting to honor his doctor/patient confidentiality oath. The patient has declared publicly that Charles hated him because he is gay, thus setting the bait for a major newspaper to vilify Charles. Now Charles means to fight the newspaper’s attack. “That’s the business they’re in,” his lawyer says, as he strongly advises Charles to just quietly take the paper’s offer of a retraction of their “misprint” on obscure page 12, and let it be—or else, prepare to get tortured. Charles is having none of it. The paper has ruined his reputation, and he’s an upright, honorable man. He insists on the truth. Meanwhile, his wife, Cath (Rebecca Pidgeon), is lamenting that her friends now cross the street to avoid her. She doesn’t care a whit about the psychotic boy; she wants her peace back. “I don’t know that you’re right in what you’re doing,” she says. 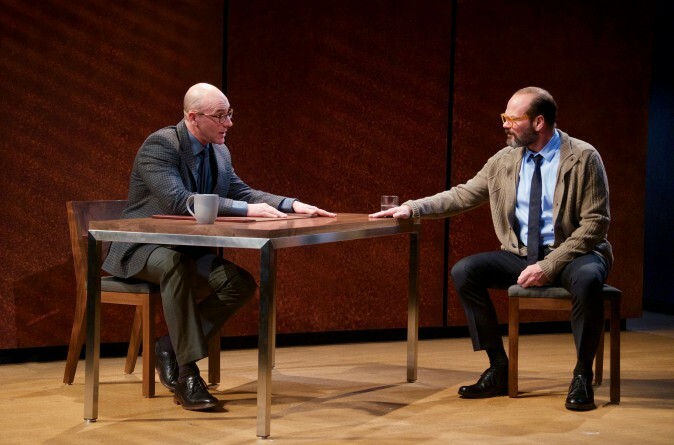 The play’s eight scenes bounce back and forth between lawyers’ offices and the couple’s apartment, on a set as sparse as the Mametian speech is pithy: two walls, two chairs, one desk. There’s practicing for the court deposition; there’s talk of Charles’s files being subpoenaed; there are pithy conversations about religion and the Bible (Leviticus, naturally, given the subject matter). There’s talk of how Jewish divine law was laid down, and that the Talmud comprises 2,000 years’ worth of human revisions, which calls into question the meaning of faith generally, as well as Charles’s faith personally. The lawyer warns about how smart men are easily taken down by savvy lawyers in court, and the need, therefore, to exclusively give “yes” or “no” answers. Charles is a very smart man, after all. He’s right. When I first moved to New York in ’88, one of my five roommates, Charles Harper, was an old-school New York “gypsy” dancer/actor and theater company colleague of William Hurt, Christopher Walken, and Raul Julia. He’d told me the worst experience he’d ever had with a director was with David Mamet, directing one of his own plays. Just because one can write, does not mean one should direct. So here you’ve got Pidgeon, who’s married to Mamet and clearly has been directed by him—a lot. And the result is some of the most wooden acting I’ve ever seen. No listening whatsoever (and the craft of acting is nothing if not all-out listening from the tips of your toes to your hair follicles). Director Neil Pepe probably had no other casting choice. This is a prime example of the showbiz adage: “It’s not what you know, it’s who you know. This adage begets another: Marlon Brando’s tongue-in-cheek wish that the craft of acting would have the same repercussions for incompetence as a tight-rope circus act with no net. To be fair, Mamet is either simply dismissive of actors, seeing them as walking, talking pawns who exist only to deliver information, or he’s a fan of the emotionless, purely intellectual Brechtian “Verfremdungeffekt” (distancing effect). But in the end, even Brecht thought his Verfremdungseffekt was a bad idea. Either way, maybe his wife is just loyally carry out her husband’s wishes. The three men in the play are solid enough, although it’s interesting to watch Chris Bauer’s game get dragged down by Pidgeon and then elevated by the other two men; it’s the theatrical equivalent of Wile E. Coyote on a high-wire, holding an anvil to squash the Road Runner, as the wire slowly stretches to the ground. Then the Road Runner zips by, “beep-beep!”, Wile E. drops the anvil, and gets zinged high into the air. This isn’t funny though—it’s Tylenol-crave inducing. Charles’s mule-headedness is called into question. Does one stand up for truth to the exclusion of all else? Or should one take into account the effect that one’s actions might have upon others, and whether or not they can bear it? It’s one of life’s more important questions, and “The Penitent” does a good job of giving your mind something to chew on, post-show.